XProtect Retail Solution is an intelligent and flexible software solution that offers full integration between Point of Sales (POS) terminal systems and XProtect Enterprise. XProtect Retail Solution is an intelligent and flexible software solution that offers full integration between Point of Sales (POS) terminal systems, product and employee systems with XProtect IP video. XProtect Retail provides a 100% digital surveillance system with full video documentation on selected transaction IDs, item numbers, terminal numbers, and employee numbers in any combination required. Whether your specific challenge is shrinkage, fraud, clerical errors, shoplifting � or you simply want to protect the innocent, your tailor-made Milestone XProtect Retail solution will point out the source of your problem and help you protect your business, your customers, and your employees. Milestone XProtect Retail software is fully integrated with Milestone XProtect Enterprise software, and can be installed locally or centrally. The main dialogue requires the setup(s) of Transaction (and Types are optional), the setup of schedule(s) for transactions and recorded image analysis, the setup of address to the Transaction Receiver, and the POS terminal-to-camera assignment. The parameters are not fixed and can be changed at will locally. On the remote site you have two main dialogues: the search dialogue and the view dialogue. The search dialogue allows you to search between the recorded transactions, as well as making queries across the database. This gives you the possibility to make cross-references, establish patterns throughout the organization, etc. 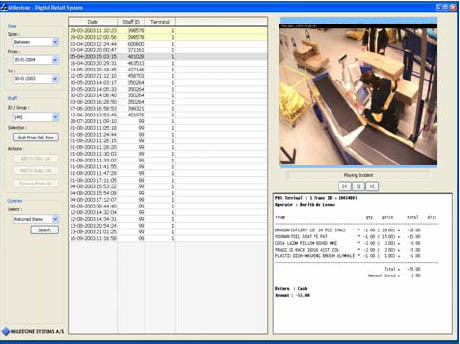 The view dialogue allows the user to view transactions and video clips simultaneously. [Find out more...] Milestone Xprotect Retail "Factsheet",1030kB pdf file.